We went to a local beach this weekend--and I may drag it out into a few posts because... well why not? Starting with a few pictures of my three favorite little boys. I can only imagine Keaton was in heaven--he pretty much lives for Finley and Braden to throw him scraps of attention. So the fact that they were hugging and kissing him? Over the moon. When they took their arms out from behind him--he aggressively grabbed them both and held their arms in his lap. Precious. And then he realized he was more interested in possibly diving off the edge of the swing. He didn't. But he thought about it. 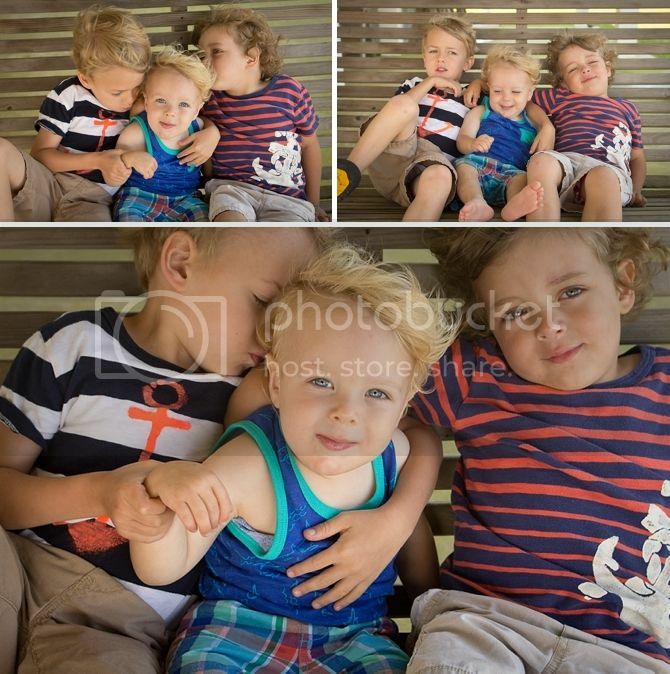 In the third picture you can kind of see Finley and Braden dramatically wiping their eyes. I'm sorry, boys. I'm sorry it was SO HARD to sit on a swing at the beach for three minutes and be nice. I'm so glad you all survived. These boys. If they weren't so cute... I'd probably lock myself in my room a lot more often. Such great expressions! I've trained James pretty well to kiss Robert to pose for photos. Oops. He apparently thinks that's how you pose for all pictures and totally kissed his soccer coach during team pictures this weekend. The coach was only mildly horrified. I'm not sure you've taken enough pictures of your children.